Because 25 percent of the people diagnosed with oral cancer have no risk factors, an oral cancer screening should be a routine part of dental maintenance. Regular check-ups, including an examination of the entire mouth, are essential in the early detection of cancerous and pre-cancerous conditions. During an oral cancer exam, your dentist will carefully examine the tongue, inside of your mouth, and your lips to look for spots or sores that are flat, painless, white, or red. Many of these spots or sores are harmless, but some aren’t so you will likely need a test to determine if a problem exists. Your dentist may choose to perform a brush test, which involves scraping a miniature brush across the suspicious sore or discolored area in the patient’s mouth. The cells collected on the brush are sent to a lab for analysis. If the results show suspicious cells are present, a biopsy can then be performed. I don’t drink or smoke. Why do I need an oral cancer screening? Even though certain elements, like lifestyle, age, and heredity, can play a role in your risk for developing oral cancer, people with no known factors can still develop oral cancer. Routine checkups and screenings allow your dentist to catch problems before they escalate. I noticed a few small sores in my mouth. Should I be worried? If you notice any unusual spots, sores, discolorations or bumps in your mouth, you should contact your dentist right away. 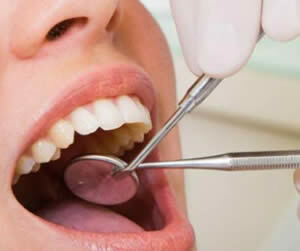 Oral cancer treatment is very successful when the cancer is detected early. Does an oral cancer screening hurt? No. During the initial exam, your dentist will look inside your mouth, checking the gums, lips, and other soft tissue for any strange spots or sores. In some cases, the doctor may use special equipment such as VELscope or ViziLite to highlight any areas of concern. If an area looks suspicious, the doctor can perform a brush test, gently scraping cells to be sent off to the lab for further assessment.